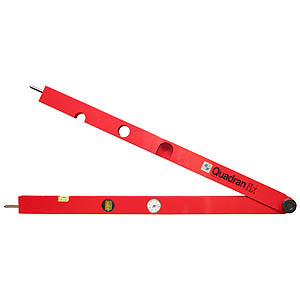 Allows easy measurement of angles. Read off the dial angle gauge in degrees with a range of 0 - 180 degrees in 1° increments. The knurled clamping screw holds the Quadranfix firmly in any position required. Two integral acrylic spirit levels for horizontal and vertical surfaces. Inbuilt end points allowing the instrument to be used as a compass for scribing can be removed if not required.